Torrential rains in the days leading up the the scheduled 9th Annual Birthday Race/UMP Summer Nationals Finale threatened to make the event a washout, but the hard-working crew at Oakshade Raceway was determined to have the track ready for race day. Pumping out the infield until 3am Saturday morning helped have the track in great racing condition for Saturday evening. The rest of the grounds were a bit soggy here and there, but that did not stop a huge crowd from gathering at Oakshade Raceway’s premiere event of the summer. Sixty-seven Late Models qualified for a chance to make it in to the big 60-lap Birthday Race Late Model Feature paying $10,000 to the winner and $500 just for making the field of 21 starters. The front row paired up Oakshade regular Rusty Schlenk alongside defending UMP Summer Nationals Champion Shannon Babb. Babb got the advantage at the start and never looked back. The race started off a bit sloppy with three cautions within the first three laps. After a couple cautions on lap 16 for Dan Wallace and Jerry Bowersock in separate incidents, the race ran caution free all the way to the finish. Babb lead Wendell Wallace after the last restart with Schlenk in third. Schlenk took advantage of lapped traffic and moved by Wallace to take second around lap 40. Babb had opened up a straightaway lead over Schlenk, but Schlenk began to cut into that advantage ever so slightly in the closing laps while both drivers continued to navigate through lapped traffic. Not enough laps remained for Schlenk to get within striking distance as Shannon Babb from Moweaqua, IL went on to win the 9th Annual Birthday Race earning himself a check for $10,000. Babb was also crowned the 2006 UMP Summer Nationals Champion for the second consecutive year. Considering the company he was in, Rusty Schlenk was not too disappointed with his second place finish. Wendell Wallace held off Jeep Van Wormer at the finish to hang on to third. Randy Korte was fifth and Dennis Erb started 16th and finished sixth. Ordway got the early jump and led the first lap in front of Scout, but Scout would be leading the way by the completion of lap two. Chris Dotson put on a show for the fans after losing control and doing a 360 in front of the flag stand and never lifting off the gas and not getting hit by any other cars. The race continued until a late caution for Dean Thompson would tighten up the field behind Jim Scout. Scout went on to win the Bomber A Main in an effort to reclaim the Bomber points lead in a very tight race. Ordway posted a second place finish followed by Garry Domoe, Brian Przepiora and Jake Rendel. Chris Williams and Chris Howard put on an exciting show in the Bomber B Main trading the lead every other lap until lap 7 when Howard was able to hold off Williams to lead two consecutive laps for the first time in the race. While those two raced each other, Dan Dippman closed in and got by both Williams and Howard to take the lead on lap eight. Howard made a final surge back to the lead on the final lap, but Dippman got back around to lead at the finish line giving Dippman his first feature win of the year. Howard finished second followed by BJ Gregory who was racing among the leaders the entire race. Chris Williams slipped back to finish fourth and Dave Sibberson was fifth. The Bomber C Main can sometimes get pretty ugly, but not tonight. The race ran caution free with some pretty great side by side racing. Brad Blonde got by Rick Dippman on the second lap to take the lead and then set sail. Blonde opened up a commanding lead over a heated battle for second between, Gene Potridge, Rick Dippman, Satch Crispen and Richard Noonan III. Blonde went on to take the checkered flag with Crispen finally winning the battle for second. Potridge was third followed by Dippman and Noonan. 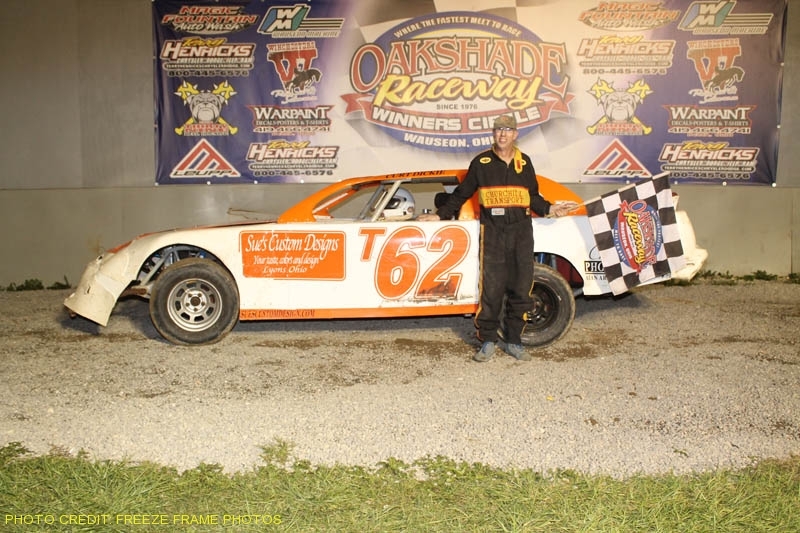 Oakshade Raceway will be back to its regular Saturday night racing program on July 22 which is Country Charm Cafe Night featuring the UMP Late Model, UMP Sportsman and Bomber divisions. Gates open at 4pm with racing at 7pm.